Granville, NY – March 15, 2011 – Architects and builders looking to specify both the safest and most effective materials in their designs and construction have a compelling new choice in soundproofing. Saint-Gobain Performance Plastics (SGPPL) has announced the company’s innovative Green Glue Noiseproofing Compound – already one of the most environmentally friendly soundproofing products available – has been recognized for use by independent testing authorities including Underwriters Laboratory and American Society for Testing and Materials. Over the past months, the Green Glue Noiseproofing Compound has undergone and passed multiple performance tests for Fire Resistance, Surface Burning Characteristics, Mold Resistance, and VOC Emission. Independent testing results validated the Green Glue Noiseproofing Compound as being in compliance with UL 263 and UL 723 tests. In addition the Green Glue Noiseproofing Sealant received a Class A rating to UL Standard 723 when testing surface burning characteristics. The independent test results provide specifiers of Green Glue products with the necessary fire safety information required when designing a new building. "These tests underscore that the Green Glue Noiseproofing Compound has been thoroughly evaluated for safety by some of the world’s most respected independent testing authorities," said Mark Darby, Global Sales and Marketing Manager, Acoustics for Saint-Gobain Performance Plastics. "We are extremely pleased to receive this recognition and consider it an important milestone for our flagship product." UL Test 263 is intended to register material performance and resistance to heat during a predetermined period of fire exposure. Following extensive testing, by Underwriters Laboratory, the Green Glue Noiseproofing Compound has been recognized to UL Standard 263 for 66 different wall systems in North America. In addition, the Compound is rated for another 21 systems in Canada. Underwriters Laboratories evaluated the surface burning characteristics of Green Glue Noiseproofing Sealant when applied to inorganic reinforced cement board, analyzing both flame spread and smoke development characteristics. The result of the evaluation concluded that the Compound, when tested to UL Standard 723, achieved a score of 0 for flame spread and 0 for smoke developed. In addition it also achieved a Class A rating as defined in NFPA Standard No. 1 for interior finish materials. ASTM antifungal test D3273 is the standard test method for resistance to mold on the surface of interior coatings and is uniquely designed to simulate a harsh environmental exposure to the high humidity and temperatures likely to promote fungal growth. UL Environment tested the Green Glue Noiseproofing Compound and the Green Glue Noiseproofing Sealant to ASTM D3723 and validated the mold resistant claim for each. As a result both products are eligible to display the UL Environment mark for Mold Resistance. Green Glue Noiseproofing Compound and Green Glue Noiseproofing Sealant were also tested and validated using the CDPH Standard Method for the Testing and Evaluation of Volatile Organic Chemical Emissions from Indoor Sources Using Environmental Chambers Version 1.1. As a result, both the Compound and the Sealant were validated by UL Environment as able to claim the following: No formaldehyde emissions detected and meets the requirements of CA Section 01350. Green Glue Noiseproofing Compound is a viscoelastic compound that can quickly and easily be applied between two sheets of drywall, plywood or any commonly used building materials. It effectively eliminates up to 90 percent of noise transfer from one room to another and is a widely-used material for residential and commercial building and remodeling applications. 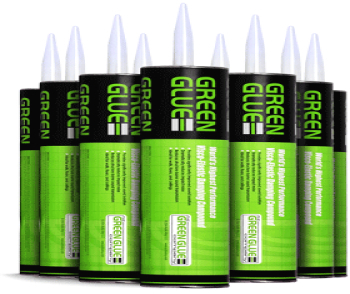 Green Glue Noiseproofing Sealant plugs up gaps and cracks in walls and ceilings that are easily overlooked but which contribute significantly to noise transfer. When applied along wall and ceiling edges, the sealant can prevent these cracks from leaking noise and help maintain a high level of sound isolation.